Venous insufficiency is a condition in which the veins have problems sending blood from the legs back to the heart. 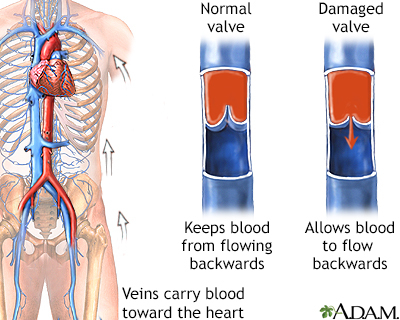 Normally, valves in your deeper leg veins keep blood moving forward toward the heart. With long-term (chronic) venous insufficiency, vein walls are weakened and valves are damaged. This causes the veins to stay filled with blood, especially when you are standing. 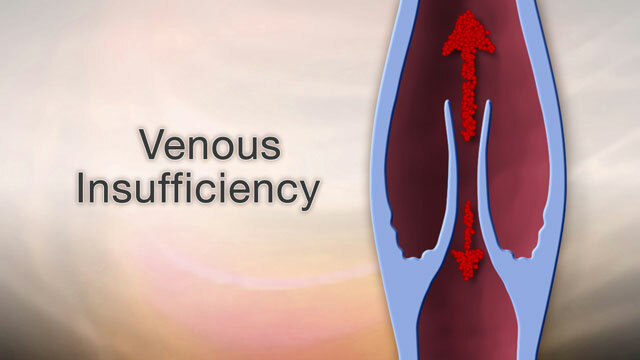 Chronic venous insufficiency is a long-term condition. It is most commonly due to malfunctioning (incompetent) valves in the veins. It may also occur as the result of a past blood clot in the legs. Your health care provider will do a physical exam and ask about your symptoms and medical history. Diagnosis is often made based on the appearance of leg veins when you are standing or sitting with your legs dangling. Care for wounds if you have any open sores or infections. You can wear compression stockings to improve blood flow in your legs. Compression stockings gently squeeze your legs to move blood up your legs. This helps prevent leg swelling and, to a lesser extent, blood clots. Sclerotherapy. Salt water (saline) or a chemical solution is injected into the vein. The vein hardens and then disappears. Phlebectomy. Small surgical cuts (incisions) are made in the leg near the damaged vein. The vein is removed through one of the incisions. Chronic venous insufficiency tends to get worse over time. However, it can be managed if treatment is started in the early stages. By taking self-care steps, you may be able to ease the discomfort and prevent the condition from getting worse. It is likely that you will need medical procedures to treat the condition. You have varicose veins and they are painful. Your condition gets worse or does not improve with self-care, such as wearing compression stockings or avoiding standing for too long. You have a sudden increase in leg pain or swelling, fever, redness of the leg, or leg sores. Raffetto JD, Eberhardt RT. Chronic venous disorders. In: Cronenwett JL, Johnston KW, eds. Rutherford's Vascular Surgery. 8th ed. Philadelphia, PA: Elsevier Saunders; 2014:chap 55. Reviewed By: Deepak Sudheendra, MD, RPVI, Assistant Professor of Interventional Radiology & Surgery at the University of Pennsylvania Perelman School of Medicine, with an expertise in Vascular Interventional Radiology & Surgical Critical Care, Philadelphia, PA. Review provided by VeriMed Healthcare Network. Also reviewed by David Zieve, MD, MHA, Isla Ogilvie, PhD, and the A.D.A.M. Editorial team.